The government of Israel is ready to restore the de jure recognition it has offered to Somaliland in 1960 as it eyes the Red Sea and the Horn, an Israeli spokesman says. The government of Israel is ready to restore the de jure recognition it has offered to Somaliland in 1960 as it eyes the Red Sea and the Horn, an Israeli spokesman says. According to a local source, Golisnews, Mr. Yigal Palmor, Israeli Foreign Ministry spokesman is quoted on the Israeli newspaper of Haaretz Daily saying his government was ready to recognize Somaliland again. He cited Israel was the first state to recognize Somaliland in 1960 when it received its independence from Great Britain. However, Mr. Palmor admitted Somaliland government has not contacted the Israeli government to seek ties. When asked a question regarding Somalia, Mr. Palmor answered: “Somalia looks like the Afghanistan of the Red Sea and the Gulf of Aden, historically speaking we know the Somali people have different believes and politics. The Somali people have different political values of which they unified in 1960 that led to the whole misunderstanding and ultimately the collapse of Somalia,” he told Haaretz Daily. While answering to a question regarding Somaliland-Israel ties, he said: “Israel was the first nation to recognize Somaliland and indeed was the first country the State of Israel has recognized, after it received it’s Independence from Great Britain. When it unified with Southern Somalia, again we were the first to recognize it. We always wanted a relationship with a Muslim country in East Africa and which we can share the Red sea with.” Mr. Palmor said his country was ready to restore Somaliland’s old status however currently the two states have no bilateral ties. He added Israel has ties with number of East African countries including Tanzania, Uganda and even Djibouti. Many analysts believe Israel has growing national interest in the Red Sea region, a key shipping route. According to well-informed regional sources Israel believes the region is also a key route for arms from Iran for Hezbollah, Sudanese regime and number of other groups in Palestine. The Red Sea gives Israeli ships access to the Arabia Sea and are within cruise-missile range of Iran. Israel also concern about Arab nations such as Egypt blocking it’s commercial shipping lines. There are unconfirmed reports also suggesting Israel wants to deploy submarines in the Somaliland port of Berbera and possibly establish a military outpost. Many Arab states have in the past expressed concerns about the proposed Israeli-base in the Horn of Africa seeing it as Israel surrounding them. The region is well known for it’s strategic importance and it was days ago when an Al Qaeda spokesman, Said al-Shihri, said “taking control of Bab El-Mandeb, will constitute an escalating victory: the Jews will be crushed in a vise, because it is through the Strait that the United States brings its support to Israel.” Bab El-Mandeb, which means “tears of gates” in Arabic is a 20-mile long inlet located in the narrowest point of the Red Sea, between the shores of the Horn of Africa and Yemen. It is no secret to Somaliland though, the former president, Mr Ibrahim Haji Egal addressed the very issue in a letter to the former Israeli head of state, Mr Yitshak Rabin in 1995. Fifteen years ago, Mr Egal saw the threat of Islamic fundamentalism and the importance of Bab El-Mandeb. Egal, who was a champion politician, died May 3rd 2002 in the South African capital Pretoria. He was succeeded by the current leader, Mr. Dahir Rayale, who is said to have avoided approaching Israel in order not to harm Somaliland’s current fragile relations with the Arabs and Muslim world, which it heavily relies on for it’s only surviving economic engines – livestock. However many of the youths in Somaliland believe ties with Israel is better for Somaliland’s economic environment because of it’s economical and technological achievements. Many argue livestock is not sustainable economy because of health issues, climate change and urbanisation and prefer developing economy based on service and high-tech sector, similar to that one of Israel and Taiwan. 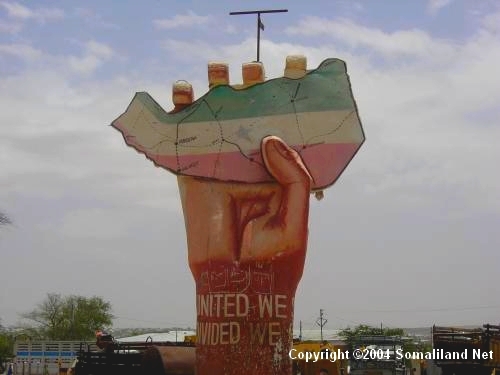 Somaliland, like Israel, finds itself politically isolated, in the middle of a hostile region and at a thorny crossroads and if anyone is to reach out to the unrecognized republic, it would be Israel. It too knows how it feels to be denied it’s statehood and self-determination. While Israel is the only democracy in the Middle East, Somaliland is the only Muslim democracy in the region. Somaliland has it’s own hybrid system of governance under a constitution was former British protectorate which gained independence 26th June 1960 and was recognized by 34 countries including Israel and the United States. It later joined South Somalia in a union that was never rectified which lasted until 1991.